Living a Fit and Full Life: Get Glowing Skin with DERMA E Vitamin C Concentrated Serum & Renewing Moisturizer! Get Glowing Skin with DERMA E Vitamin C Concentrated Serum & Renewing Moisturizer! DERMA E has quickly become one of my favorite brands as I've loved all their products that I've tried so far! As a mom of 4 my skin has been somewhat neglected over the past few months as so many other things have gotten in the way of me taking care of myself and my skin. Since my skin is super dry these days, even a few days of not keeping up with a good skincare routine can seem to really take it's toll. 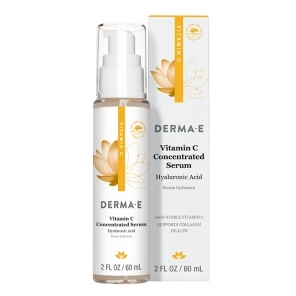 DERMA E's Vitamin C Concentrated Serum has quickly brightened my skins appearance. I've also noticed that my fine lines seem to have disappeared and my skin looks radiant and healthy. 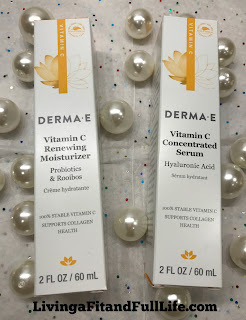 I also have to mention that I love how quickly DERMA E's Vitamin C Concentrated Serum absorbs into my skin. 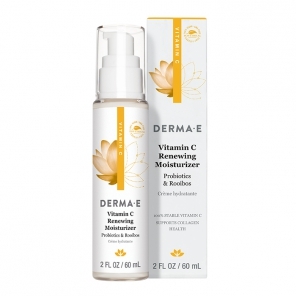 DERMA E's Vitamin C Concentrated Serum is the perfect way to bring your skin back to health! DERMA E's Renewing Moisturizer is a miracle worker for my dry skin! After I apply DERMA E's Renewing Moisturizer my skin looks and feels amazing. I love that it's a light moisturizer, absorbs quickly and doesn't feel greasy at all. I've had a sun spot on my jawline for years that seems to lighten and darken over and over again but since using DERMA E's Renewing Moisturizer it's gotten so light that it's almost unnoticeable and my skin tone looks even and healthy like never before! These DERMA E products are absolutely incredible and I highly recommend them!